The Gratitude Minute is a personal gratitude video journal, and a moment to align yourself with your highest intention for a day at your best. It only takes a minute. I‘m grateful for souls. When we see one another through the eyes of the soul, there is only love. The pure heart of the soul cannot hold onto fear, pain, anger, hatred, bitterness, disrespect, envy, or spite. All of that falls away at the soul level. The denser physical form and mind easily soak up these unpleasant thoughts, emotions and beliefs. It’s like we have static cling for such negativities toward one another. We just have to walk through an environment thick with impurities, and we magnetically draw them to us. Our protection against this static build-up is our higher consciousness. We can rise above the cloud of chaos as we connect with a higher, lighter realm and surround ourselves with those who glow most brightly. How wonderful it is that, at our innermost core of being, we are pure souls! I am grateful for souls. We are united in our spiritual sense of the home of the soul. We are one kind, one mind, as the light of a universal soul. Within each of us is pure light. I am so grateful to see the light within. Blessings. The Gratitude Minute is a personal gratitude video journal, and a moment to align yourself with your highest intention for a day at your best. It only takes a minute. I‘m grateful for friends. Friendship is our safe zone in which we can trust and hope and share with those we love. We can be honest about whatever we discuss while having the surety of continued friendship. We can ask for help or lend a hand with no need for keeping score of what one might owe the other. Friends tickle our funny bone when we are too serious and remind us to be level-headed when we’re a little too ditsy. Friends drag us out for a much needed holiday when we really need to get away. We treat our friends like we would prefer to be treated, with respect and admiration, and with honesty and sincerity. We joke and laugh together. We cry and support one another. Friends do what’s best for one another, even without having to set a plan into motion. Friends are the family we choose. Friends are the brotherhood and sisterhood of humanity. Thank you for being a friend. The Gratitude Minute is a personal gratitude video journal, and a moment to align yourself with your highest intention for a day at your best. It only takes a minute. I‘m grateful for courage. You truly can’t imagine how strong and courageous you are until adversity challenges you to prevail, conquer and succeed against all odds. When you’ve got to step up or collapse, and you choose to stand, that;s when you know your true strength. That’s when you discover strength from something greater than you coming through you. When you admire someone courageous for being brave in circumstances you could not imagine, be grateful for their illustration of grace under fire. When you find yourself in a situation beyond imaginable abomination, remember the model of gallantry you were witness to. That bravery is within you, too, ready in reserve for when you need it most. 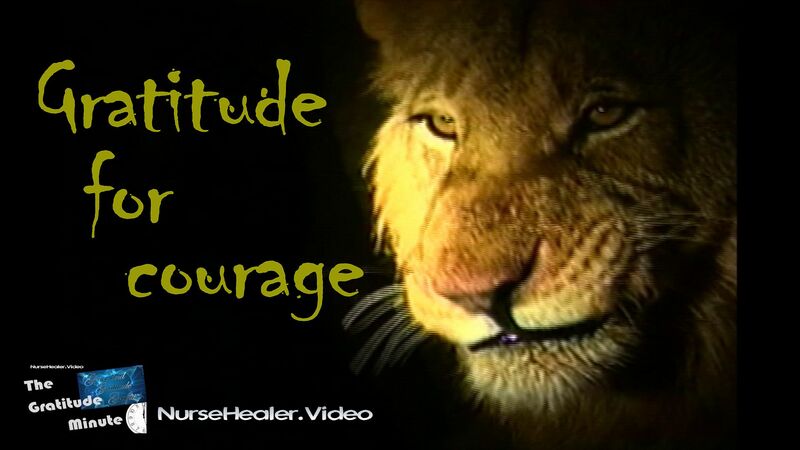 Be grateful for courage where ever you see it, where ever you need it. Courage only comes from within. It’s there. The Gratitude Minute is a personal gratitude video journal, and a moment to align yourself with your highest intention for a day at your best. It only takes a minute. I‘m grateful for family. Everyone has family to be grateful for. Some families have common ancestors. Others are related in other ways. There are friends we call sisters. We see familiar faces that remind us of home. Some simply evoke a feeling of remembrance of a time that didn’t actually exist in this lifetime. These are our family; our family of souls, our family of spirit, our human family. And many of us extend our concept of family to our furry friends we call our “babies”. Think fondly of a member of your family with gratitude. Give them a moment of your heartfelt love and appreciation. The Gratitude Minute is my own personal gratitude video journal, and a moment to align yourself with your highest intention for a day at your best. It only takes a minute. I‘m grateful for French fries. Maybe that sounds awful for you; but for me it’s a delicious cultural cuisine filled with nostalgia and comfort. From the flavorful fries at the drive-in restaurant that had real car hops on roller skates to the thick soft juicy fries that Mom made, there is no food that I can identify with more clearly as a staple food of my upbringing than French fries. I don’t care if it’s skinny near flavorless frozen fries baked in the oven, French fries just seem to make a meal for me. Whatever it is that always makes you feel happy, enjoy it if you can, and find a near equal substitute if you can’t.